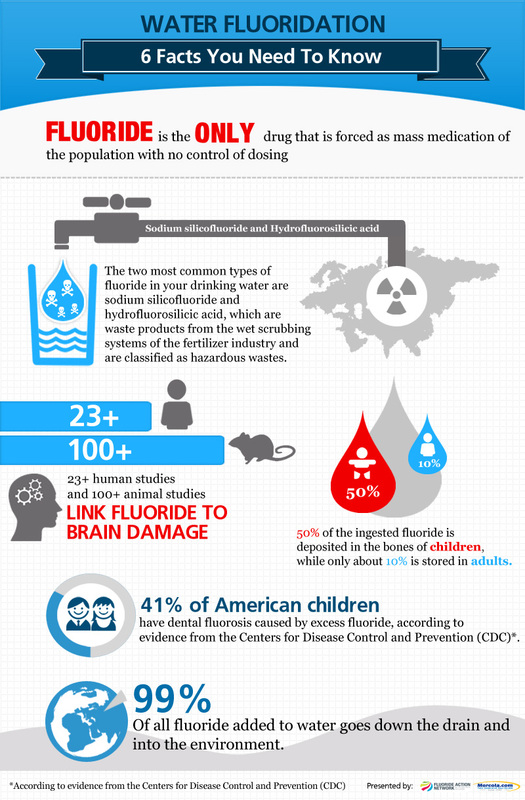 Is fluoride bad for you? 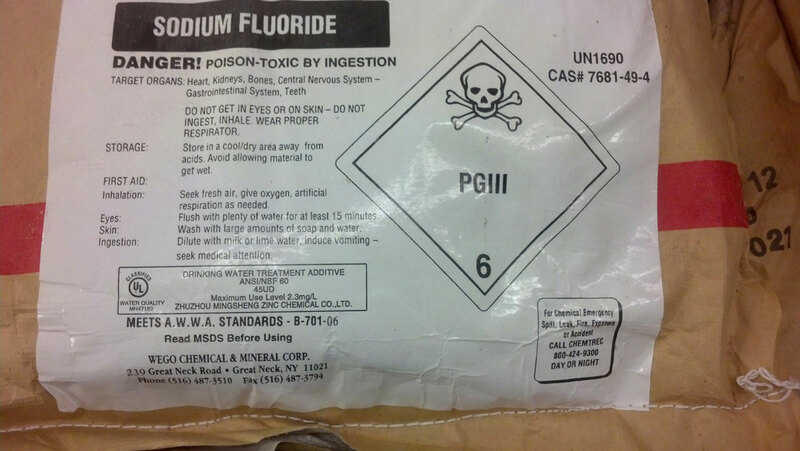 Should you be concerned about sodium fluoride being in your water or toothpaste? 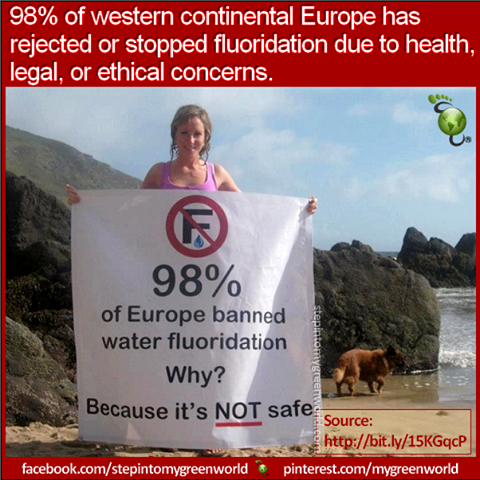 Learn everything you need to know about fluoride and why Sweden, Norway, Austria, Finland, China and more countries have banned it. A form of calcium, hydroxylapatite, is known to gradually harden and calcify arteries and lead to atherosclerosis. 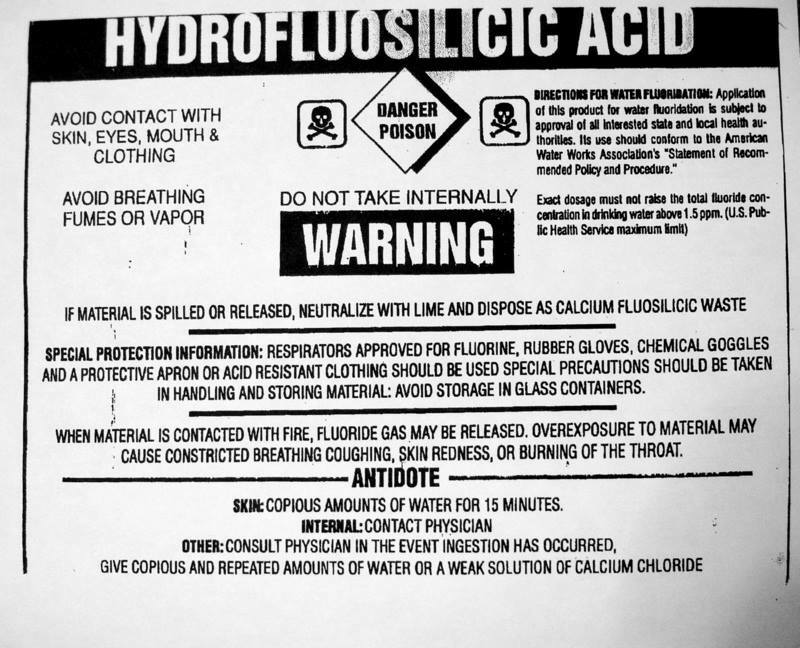 Fluoride forms fluorapatite by replacing hydroxyls in hydroxylapatite‚Äîsimply put, this process enhances the cardiotoxic effect and makes it harder for your body to remove it. I can‚Äôt stress the importance of regularly consuming water enough. I personally drink at least eight to 10 eight-ounce glasses of water every day to support my healthy body. It is well known that drinking plenty of water is important for proper hydration, body temperature regulation, digestion, and nutrient metabolism. It is also crucial in maintaining the health of nearly every organ in the body. It‚Äôs not just important that you drink water, but that you also consider the type of water you consume. I always get my water from a filtered tap, because municipal drinking water straight from the tap is known to contain a heavily toxic chemical‚Äîfluoride. 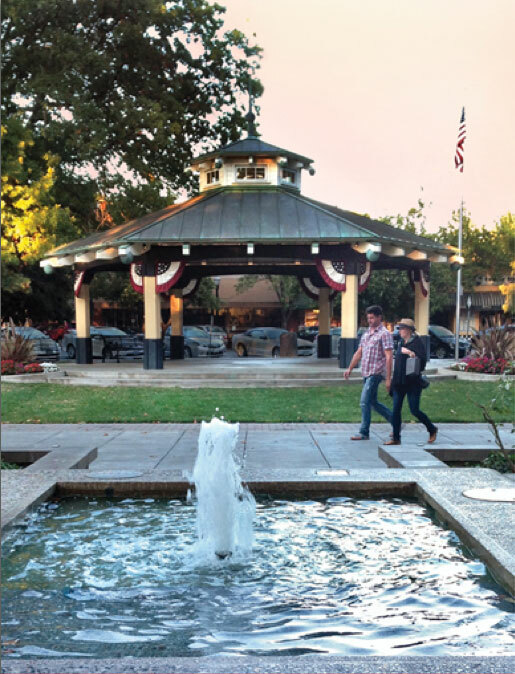 Editor: Throughout the last many months of debate over the fluoridation of Healdsburg‚Äôs water, pro-fluoride medical professionals have made the argument that the amount of fluoride in our water is miniscule and is at a level determined to be safe. This always boggles my mind. 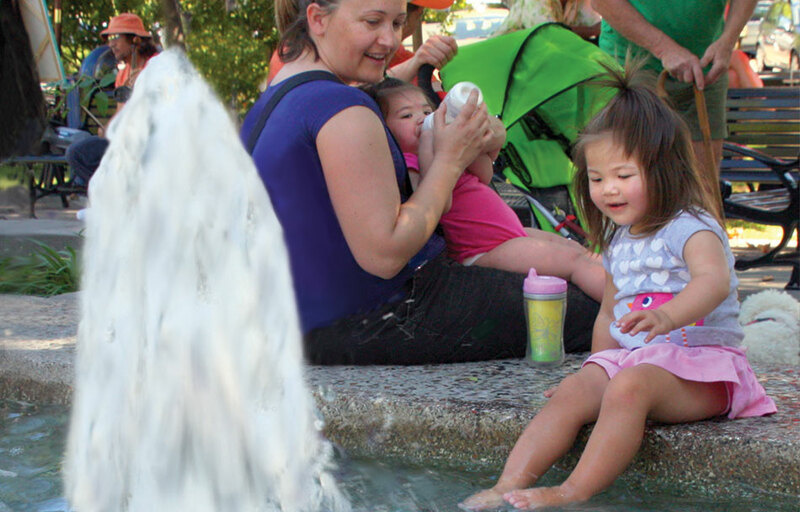 Healdsburg‚Äôs water department does indeed control the concentration of fluoride in the water, but they can‚Äôt control the dose. In what other instance would a medical professional prescribe medicine to a person without also prescribing the dose? 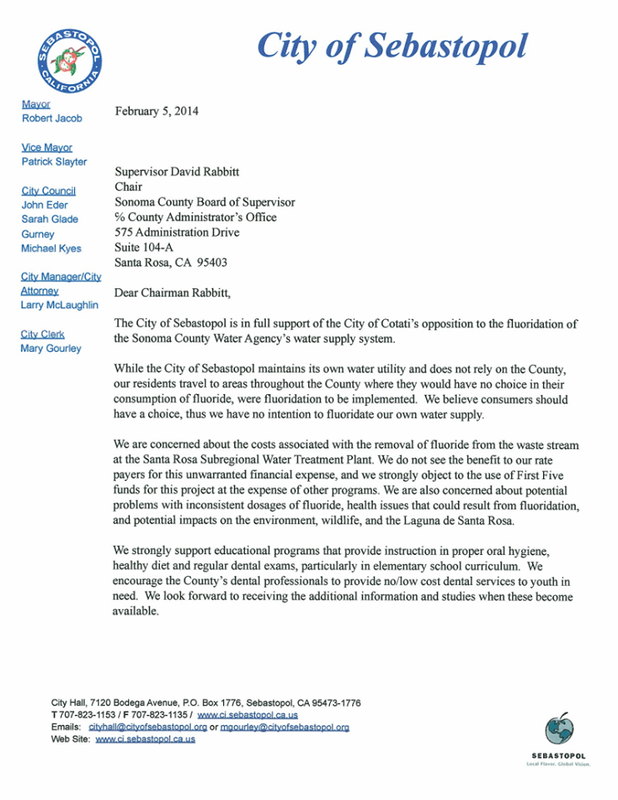 In Healdsburg, someone who drinks a lot of water gets a greater dose of fluoride than one who drinks little. 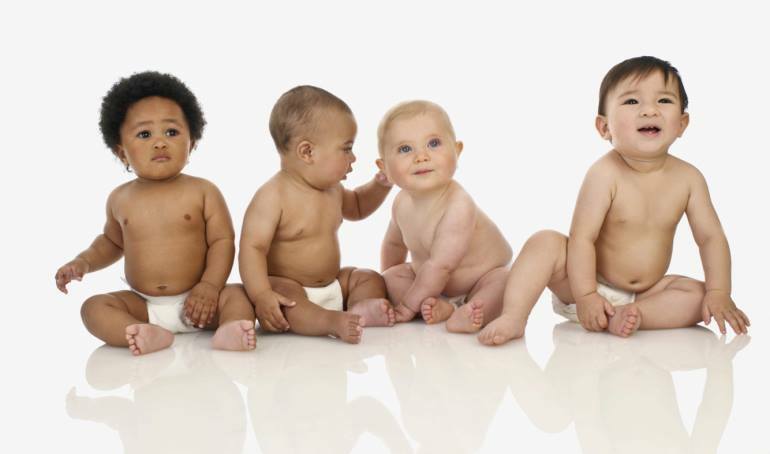 A child‚Äôs consumption isn‚Äôt differentiated from an adult‚Äôs. The elderly, the healthy and those with compromised immune systems all get the same concentration, but different doses, depending on how much fluoridated water they drink. 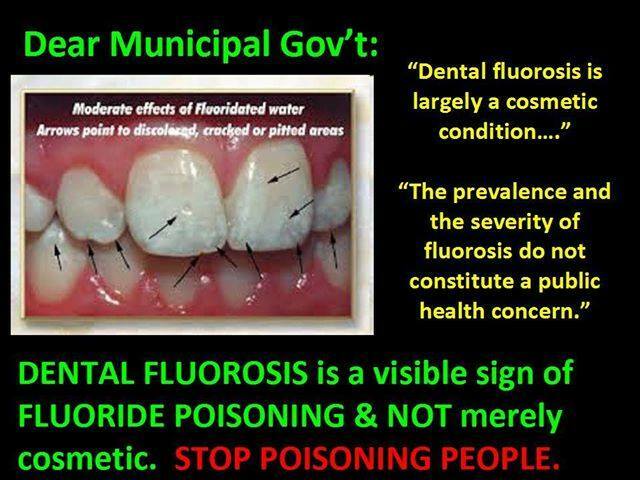 We should all educate ourselves about the fluoride in our water. Unlike chlorine, which is added to make our water safe, fluoride is added to treat us, our bodies, and in an indiscriminate manner. I encourage anyone who cares about their health to Google the company that supplies our fluoride, and read the warnings. (Solvay Chemicals/sodium fluoride.) 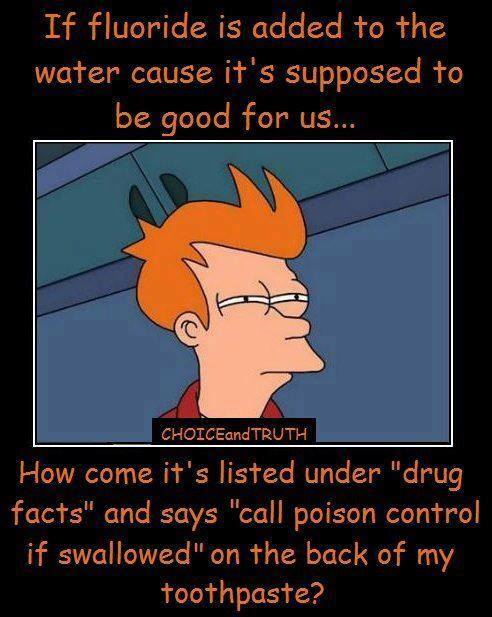 It bothers me a great deal that intelligent, educated people would think that just because something toxic can be mixed with water and ingested in small concentrations without noticeable ill-effects, that you can also swallow it and bathe in it 24/7, 365 days a year, for your lifetime, and still be unaffected. Toxic effects often go undetected, disguised as common chronic illnesses or just the effects of aging. 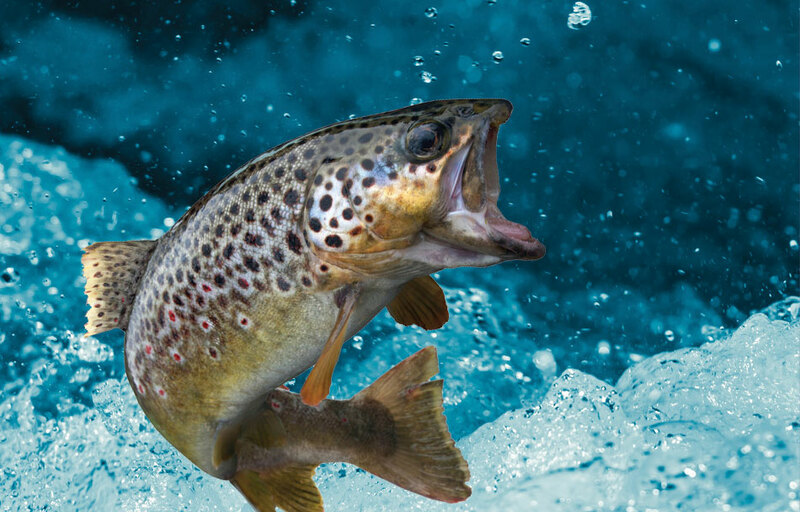 There are so many substances that were commonly used 60 years ago that we considered safe: lead, asbestos, nicotine, DDT … Some people say that they‚Äôve been drinking the fluoridated water here with no discernible harm to their health. 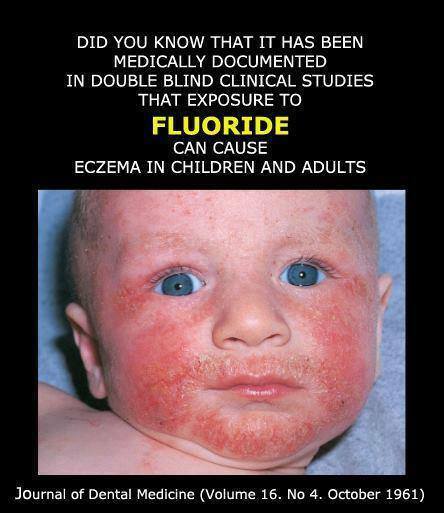 But the chemical companies that produce the sodium fluoride we use cannot produce any peer-reviewed studies that show that it‚Äôs safe for human ingestion. I have to ask the question: how did this ever get into our water without that proof? Dosing an entire city is no way to conduct a safety test and the good people of Healdsburg should not be subjected to this experiment. Our water is a precious resource. 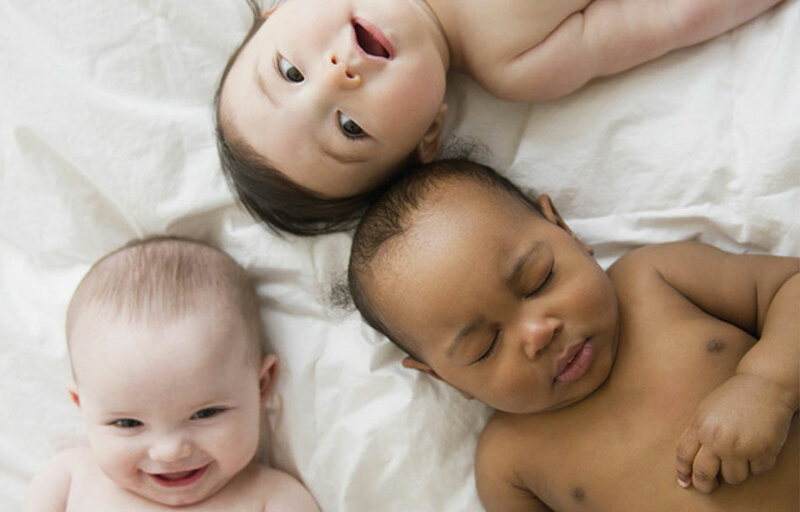 We should do everything we can to make it as unadulterated and as pure as possible and still be safe. Please Vote No on Measure P.
A dentist and historian, John Coquhoun lived in Auckland, New Zealand while pursuing a career as a researcher, dental practitioner and public health official. He graduated from the University of Otago in New Zealand in 1948 with a Bachelor of Dental Surgery degree and received his diploma for education in Sydney. After 7 years service in the national School of Dental Service, as a teacher and administrator, he entered private practice. In 1971, he became Principal Dental Officer for the Auckland Health District. During this period he carried out research in both dentistry and Auckland social history. Until 1980, Colquhoun was a keen advocate of water fluoridation. In that year, he was sent on a world study tour by the New Zealand Department of Health for the purpose of investigating recent research into fluoridation. Upon his return he was appointed to the post of Chairman of the Fluoridation Promotion Committee of the New Zealand Dental Health Foundation. After returning from his study tour, Dr. Colquhoun reported the new discovery (for 1980) that dental decay was declining in “western” counties, with or without fluoridation, and that the differences between decay rates in fluoridated versus non-fluoridated locations were much less than had been claimed would occur. Nonetheless, like many of his professional colleagues of the day, Colquhoun was very reluctant to admit that fluoridation was a failure. He advocated, and his superiors agreed to a new approach based on the belief that fluoridation still provided a marginal benefit. Colquhoun felt he was reinforced in that belief by his superiors’ claim that new statistics, collected for all New Zealand School Dental Service patients (98% of the childhood population) revealed such a benefit. He was shocked to discover, when the statistics were sent to him, that they revealed no such benefit. In fact, in most Health Districts the percentage of children who were “caries-free” was higher in the non-fluoridated areas of New Zealand. Colquhoun disagreed sharply with his superiors’ action in circulating a document, “overview of fluoridation statistics,” which omitted the Health District statistical information on fluoride and “disgracefully doctored” the remaining statistics, claiming that a marginal benefit existed. 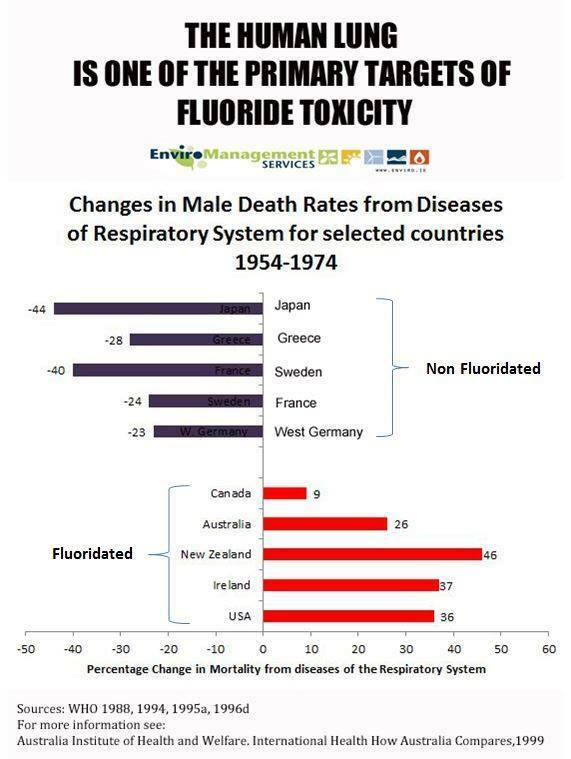 When, in addition, he discovered that dental fluorosis prevalence (a sign of fluoride toxicity) was much higher than expected in fluoridated areas, Colquhoun publicly changed his stance on fluoridation in 1983. Dr. Colquhoun continued his research, which contributed to the earning of a Doctor of Philosophy degree in 1987, and was appointed to the post-doctoral position of Honorary Research Fellow of the University of Auckland. 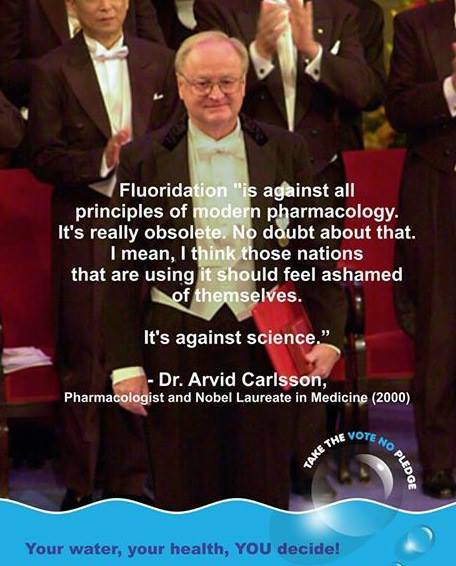 In 1992 he became editor of the Journal of the International Society for Fluoride Research (Fluoride), a position which provided a good overview of fluoride research in different academic disciplines. Dr. Colquhoun passed away peacefully in his home on March 23rd, 1999 at the age of 75, remaining intellectually active almost until his final moments. An extensive review of research from the UK‚Äôs University of Kent has concluded that fluoridation of municipal water supplies may be more harmful than helpful, because the reduction in dental cavities from fluoride is due primarily from its topical application instead of ingestion. 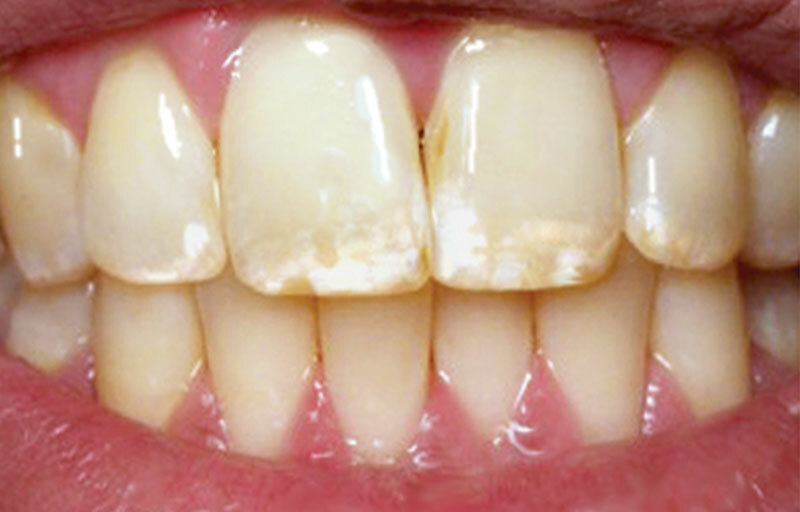 Published in the Scientific World Journal earlier this year, the review, which covered 92 studies and scientific papers, concludes that early research showing a reduction of children‚Äôs tooth decay from municipal water fluoridation may have been flawed and hadn‚Äôt adequately measured the potential harm from higher fluoride consumption.The researchers note that total fluoride intake from most municipalities can significantly exceed the daily recommended intake of four milligrams per day, and that over-consumption is associated with cognitive impairment, thyroid issues, higher fracture risk, dental fluorosis (mottling of enamel) and enzyme disruption. The researchers also found clear evidence for increased risk of uterine and bladder cancers in areas where municipal water was fluoridated. FLUORIDE — Is it really safe? Editor: Saturday‚Äôs (Sept. 30) Forum on the topic of Understanding Water Fluoridation was very informative. A doctor and two dentists attended and were able to answer questions. 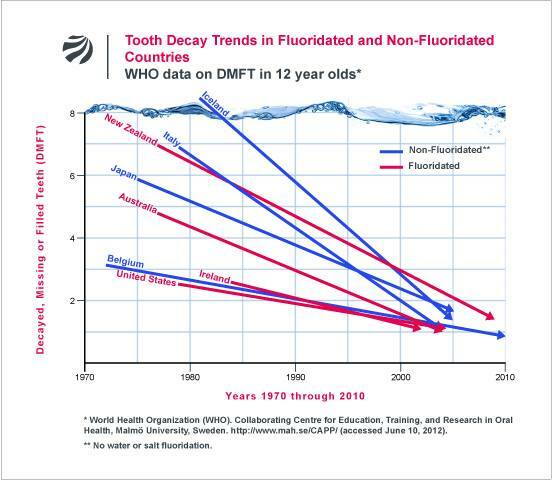 We learned that in the last 50 years tooth decay has declined in both fluoridated and non-fluoridated areas. 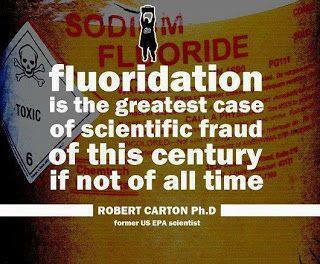 There has never been a single randomized controlled trial to demonstrate fluoridation‚Äôs effectiveness or safety. Once fluoride is added to the public water system, it is impossible to control the dose since it depends on how much is consumed. The chemicals used to fluoridate water are not pharmaceutical grade, instead they are a toxic waste product of the phosphate fertilizer industry. Since 97 percent of Europe and the rest of the world have banned fluoridating their water since they do not believe there is conclusive evidence that it is safe, perhaps we can also decide that the best method for reducing cavities in children is by teaching proper oral hygiene and good nutrition. Assuming we are in doubt, let‚Äôs protect our health and ‚Äúright to choose‚Äù and vote it out!